For dental assisting, a sound background in biology and English are important. Higher levels of science can only help, but are not required. Good speaking and writing skills will be instrumental in your success, not only in college, but also on the job. While basic math skills are a must, higher levels of math are not required for this field. 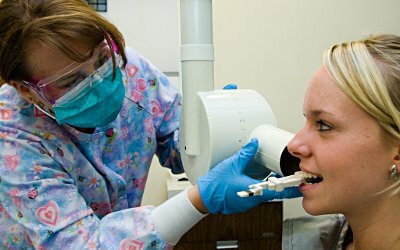 Good computer skills are important as new technology enters the dental field. Assistants are now using computers in the dental treatment room for patient records and taking digital images. Teamwork is a very big part of any dental practice. So, having the ability to work well in a team environment is a real plus. Manipulation of small instruments and mixing of various dental materials is a big part of the Registered Dental Assistant’s and Certified Dental Assistant’s duties. Having the ability to follow step-by-step procedures is also a prerequisite for success as a dental student. Successful dental assistants are genuinely interested in other people. Being dependable and responsible will help dental assistants excel in the field. They like working with their patients to improve their dental health. Detail-oriented individuals find dental assisting truly rewarding. Demonstrate the skills necessary to provide a safe work environment for patients and staff, including knowledge of OSHA requirements and in-depth knowledge of infection control protocol. Demonstrate knowledge of radiation safety and a proficiency in clinical radiographic skills. Demonstrate mastery of basic dental theory including concepts of dental anatomy, dental disease, and restorative dentistry. Perform chairside duties completely and proficiently, including working knowledge of dental materials. Demonstrate the ability to perform dental laboratory duties. Possess the knowledge and skills needed to promote preventive dentistry dental care and to provide patient education regarding dental care. Demonstrate basic office skills that are applicable to the business side of dentistry including computer hardware and software. Possess a professional and collaborative work ethic that recognizes the legal and ethical responsibility of those employed in the dental field including HIPAA and patient privacy knowledge. Demonstrate effective communication skills, both written and oral, when dealing with dental patients and the dental healthcare team.